There are potentially thousands of wild macadamia descendants hidden away on private properties or in bushland, so we need your help – and that of your neighbours and friends – to find them! If you know of an old macadamia tree or two (or several! ), that could be around 100 years old, we would love to hear from you! Register your tree(s) via The Wild Macadamia Hunt data portal. Click Get Started then Add a record. Log in if you have an account with ALA or sign up. Please contact us by phone on 07 3816 9720 if you require any assistance. Use our Macadamia identification fact sheets to identify your tree. We would love to hear the story behind your old macadamia tree. Join the conversation via The Wild Macadamia Hunters Facebook group to share your stories and learn more about macadamias. 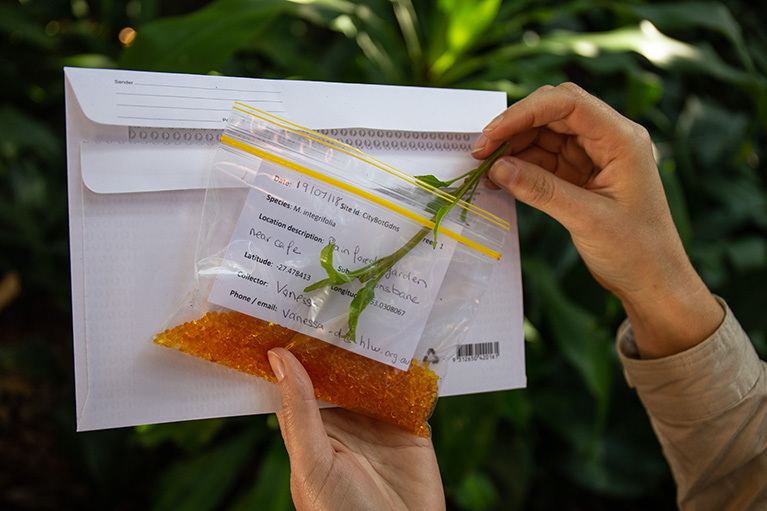 Once you’ve registered via The Wild Macadamia Hunt data portal and we’ve reviewed your tree’s details and it is one we would like to investigate further, we will send you a leaf collection kit. The kit contains instructions on how to collect and supply leaves using the provided storage materials and prepaid envelope. Don’t forget to get permission first if you want to collect leaves from someone else’s macadamia tree. And do not collect from protected areas such as National Parks and Forest Reserves unless you have a permit from the Queensland Government. Macadamia leaves must be carefully collected and stored if they are to be used for future genetic analysis. Genetic analysis will help discover the ancestry or origins of the tree which can be used for future conservation efforts. For detailed instructions on how to collect macadamia leaves for genetic analysis please download the Leaf Collection Instructions. *Please do not collect any macadamia leaves before we send you the leaf collection kit as their genetic material deteriorates quickly and collection from protected species is regulated.